As a sign of confidence in the "CIS" performance, the monthly rent will be available at the minimum price until 20.05.2016, after checking the product in real time you will be able to decide if you need "CIS" or not. VSA indicator which draws arrows (does not redraw). Its signals indicate the price reversal on a calm market or decrease of the rise or fall rate during strong movements. Works fine in the flats. As the indicator uses volumes in its calculations, be careful during evenings and night times, when there are very small volumes. It is recommended to be used only on multiple currencies or at least on different timeframes. 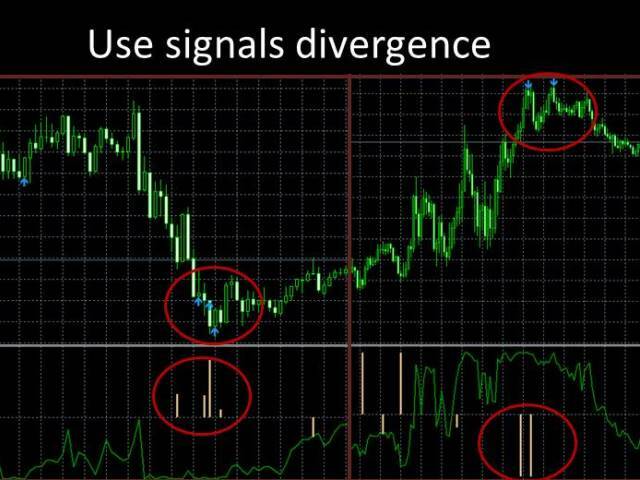 Divergence indicator, its signals are the rise or fall of the histogram. If the price rises and the histogram falls, it indicates a soon price reversal. Often the histogram highlights only one bar, the higher the column - the greater the divergence. Do not rush with the entries, it is necessary to wait for the right moment. The VSA indicator on M5, M1 and M15 will help with that. Trend indicators: channel, Fibonacci levels, Fibonacci fan (the default period is 240 H4). When the indicator is attached to the EURUSD, EURCHF, EURCAD, EURAUD, EURNZD, EURJPY, EURGBP currency pairs (this is an example, you can use any instrument), the CIS starts collecting the EUR index data and displays it in the window of each currency pair. When the EUR overbought or oversold limit is reached (this threshold can be adjusted in the settings) the indicator starts looking for the entry points for each instrument with the highest probability and marks the with arrows. It is recommended to exit the positions at the same time the opposite side of the index is reached, it also possible to close deals individually using the indicators. All values are passed to the global variables to allow automation of trading. After 5 bars the signals are canceled. The default parameters are set for trading a single instrument, as the strategy tester does not support multi-currency trading. When trading a basket, the position holding time increases, for example, signals on M1 - about 1-3 hours, on M15 - 15-30 hours, etc. It is recommended to use multiple periods. Enable the notifications so that you don't have to sit by the monitor. 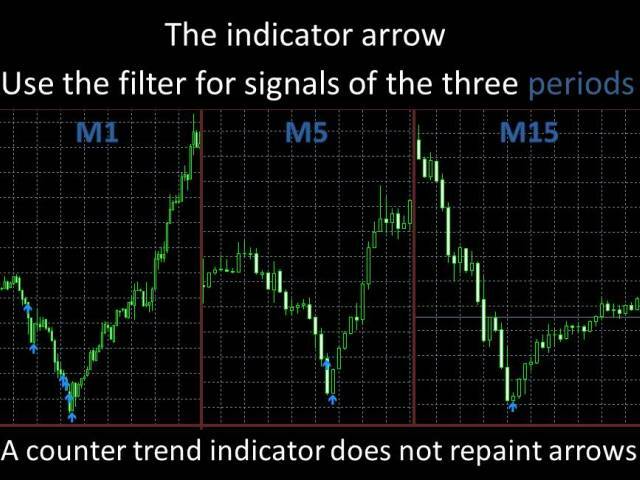 Filtering signal counter - signal filtering for more accuracy; it is recommended to disable it when using 3 charts. Period trend line - period for the trend lines. Show Fibo - show the Fibonacci levels. Color Fibo - color of the Fibonacci levels. Size Fibo - width of the Fibonacci lines. Show FibFan - show the Fibonacci fan. Color FibFan - color of the Fibonacci fan. Size FibFan - width of the Fibonacci fan lines. Show Trend - show the trend channel. Color Show Trend - color of the trend channel. Size Show Trend - width of the trend channel. Send Notification - send messages using Push-notifications. Notification Index, 0=off - notify about the EURO index line when a level is reached, 0 - disabled. Send Mail - send notification to email when a signal appears. CIS performs calculations in real time and can not recalculate past bars, so it is recommended to set it on a VPS, the past graphic objects may be deleted after a terminal restart. High-quality modeling of quotes is required for testing! CIS can be used not only for intraday trading, but also for long-term periods, such as D1, test and check CIS on different pairs and timeframes, I hope You find it useful. Excellent Indicator, High Recommended. Would give 10 Stars !Very Good Support from Gennady ! Changing the Indiciator for your individual Trading Needs. -Added the EURO Index line (works only in online mode). It is now easier to determine the trend reversal. For the correct operation, it is necessary to open the charts (EURUSD, EURGBP, EURAUD, EURCHF, EURJPY, EURCAD, EURNZD) (with the same timeframe, M1 for starters, in order to facilitate the understanding of its operation) and to attach the CIS to them. 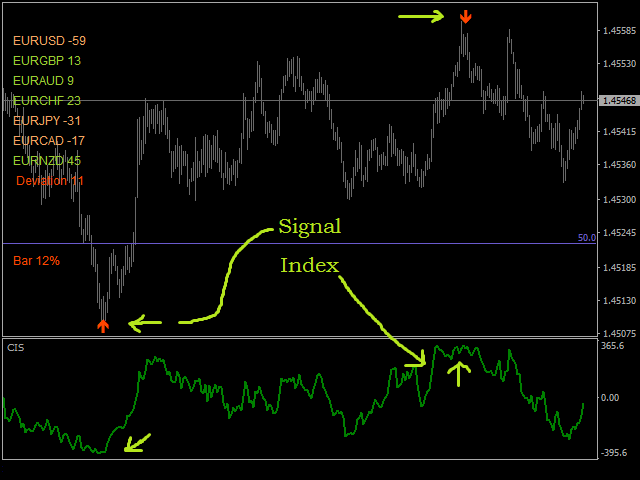 With the help of the global variables the indicator starts plotting the EURO index line. There should be no zero values, the indicator will show which way to go. -Added automatic trend channel and Fibo tools. -Added small indicators for "bar closure" and "Deviation of the EUR index" - the difference between the current and the previous values for determining the possible strength. -Fixed and added certain notifications.